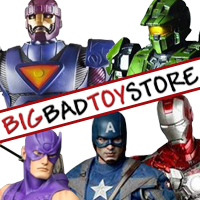 Toy Reviews, Comic Book Reviews, Movie Reviews and More Reviews! This review has moved! Click through to check it out over on my toy review blog, ToyReviewDaily! Follow me on Twitter to get notified when new reviews are posted! Daily Toy Reviews: Halo Mega Bloks, My Little Pony, and G.I. Joe Renegades!